We’re told that the ‘priv’ in BlackBerry Priv, the Canadian handset maker’s first Android phone, stands for both privilege and privacy. Privilege perhaps because the Priv is being pitched very much as a flagship Android device with a price tag that pits it against the iPhones and Samsung Galaxy S6s of the world. Standout premium features include a 5.4″ curved display like the one Samsung recently debuted on the S6 Edge, an 18 MP dual-flash camera with optics ‘certified’ by Schneider-Kreuznach — similar to Nokia’s emphasis on Carl Zeiss for its camera-focused flagships back in the day — and a slide out physical QWERTY keyboard (more on that later). Meanwhile, Privacy is a reflection of BlackBerry’s legacy in security and some of the privacy feature additions it’s bringing to Google’s OS. These include switching on encryption by default, a new picture-based pass code that claims to protect against finger smudge trails and presumably key logging, and an app by BlackBerry called DTEK that gives your device an overall security rating and monitors things like changes to app permissions going forward. However, after using the handset for just over a week, ‘priv’ might also stand for privative, denoting the absence or loss of an attribute or quality. What that attribute or quality is I can’t quite put my finger on, but I’m sure it has something to do with the Priv’s physical keyboard, which, like a bad second date, never quite lived up to early expectations. BlackBerry made a name for having best-in-class QWERTY keyboards but this one suffers from being a ‘slider’ and one that is attached to an already very tall candy bar phone. Holding the heavy and wide device while typing on the slide out keyboard feels clunky and I found my hands tiring more quickly than I expected. For comparison, the Priv weighs 192 grams compared to the iPhone 6 plus at 172 grams. The extra heft is partly due to the Priv’s huge and all-day 3410 mAh battery, which by itself is welcome but has a particular trade off when it comes to dexterity and overall comfort. The second issue I have with the keyboard is, like most sliders before it, the top row of keys feel a little close to the protruding edge just above it. Due to ensuring the Priv is as thin as possible — though it’s still a fairly beefy 9.4mm, something that BlackBerry unconvincingly claimed makes it more comfortable to hold — the keys are also quite flush with the device and so don’t quite have as much travel as the BlackBerry Q10 or the Bold of yesteryear. Or at least as far as I can remember. Thirdly, the on-screen keyboard, which is the same one found on BlackBerry 10, is rather brilliant, not least its auto correction and word suggestions. As a result I found myself rarely, if ever, sliding out the Priv’s physical keyboard, and I say that as someone who was a QWERTY holdout until I finally made the switch to an iPhone 5s. I even wrote to Steve Jobs on the matter. Finally, the distance between the physical keyboard and the top of the screen where many Android apps place important on-screen buttons means you’ll continuously find yourself adjusting your hand position as you jump from keys to screen unless you have especially large hands or long fingers. That’s a shame since I really like the way the physical keyboard on the Priv is touch enabled, doubling up as a touchpad that can be used to rapidly wade through tons of email or quickly scroll web pages and other documents. You can also map specific keys to quickly launch applications or actions via a long-press. You know, all the things that BlackBerrys are traditionally good for, like actually getting stuff done. So if you aren’t going to buy the Priv for its physical keyboard — and undoubtedly some people will — then isn’t this just another Android device? In short, yes. But judged solely as an Android phone sans physical keyboard it still has a few things going for it. I particularly like the way BlackBerry has brought over its BlackBerry Hub from BlackBerry 10, a unified inbox for all your messages, including email accounts and Twitter DMs and interactions. You can now also swipe to ‘snooze’ a message, having it float to the top of your in-box again at a later time, say in two hours, or when you arrive at a particular location, such as returning to the office after lunch. Google’s new mail client ‘Inbox’ has a similar feature, but nonetheless it’s a welcome addition to BlackBerry Hub. In addition, you can swipe/pull down within the Hub message list for a quick view of up to 4 of your next meetings or calendar events, which is a simple but nice touch. It’s in the details where you’ll likely appreciate the Priv more over time. Gestures in BlackBerry 10 are also something I miss and, although not quite on the same level, BlackBerry has brought over some of that thinking to its first Android phone. Swipe up from the bottom of the phone from anywhere and it brings up three tappable shortcuts to quickly launch any of three apps. I have mine mapped to BlackBerry Hub, Google Now and Twitter. The Priv also introduces something BlackBerry is calling the productivity tab, an on-screen tab that sits along the screen’s curved edge to provide an ‘at a glance’ view of important info from BlackBerry Hub, Calendar, Task, and Contacts. Despite being a bit fiddly, it works quite well and goes someway to justifying that curved display. That said, replicating BlackBerry 10’s ‘Peek’ feature, which let you access the full BlackBerry Hub from anywhere with a quick left to right swipe, would have been preferable. There is no doubting the effort BlackBerry has made here to not only bring a new premium and its first Android device to market — a significant move in itself — but also one that offers something different in a largely commoditised soup of Android devices available at every price point imaginable. Once you go the Android route, there’s little room to differentiate. What there is usually comes down to branding, largely off-the-shelf hardware choices and, to a much lesser degree, software. 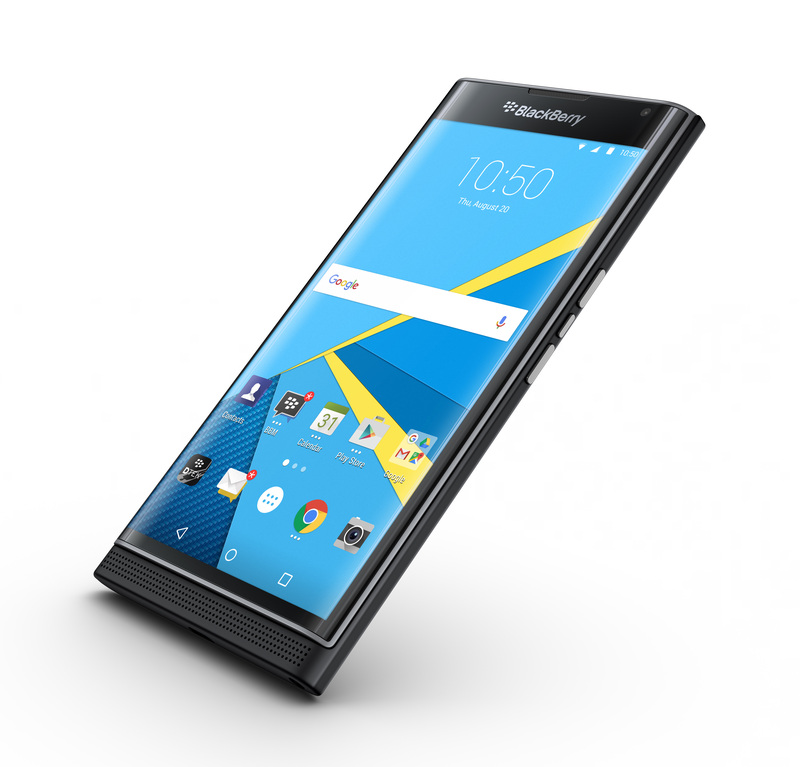 The BlackBerry Priv has made some interesting choices in all three areas. How strong the BlackBerry brand remains, I’m not sure, but the Priv will likely enhance it not diminish it. It’s priced premium and feels it. The camera is top of the range, including shooting 4K, battery life is solid, it has the latest curved screen technology, and a fast modern processor — this thing is no slouch. And now that typing on glass is the norm, you can’t get any more different than a physical QWERTY, even if I can’t help thinking this will deter as many people as it will entice, given the tradeoffs that a slide out keyboard almost always entails. And in one sweep, by switching to Android, BlackBerry has solved the company’s notorious ‘app problem’ — the lack of apps on BlackBerry 10 being the number one complaint from existing and past customers, myself included. But the company has gone further, tweaking Android to be more secure and privacy-minded out of the box and has brought over some of the best apps and software features from BlackBerry 10 or at least re-interpreted them for Android. Both aspects are to be applauded. However, as gallant as BlackBerry’s first Android effort is, the fact that I found the Priv’s physical keyboard to be almost entirely redundant means there are almost certainly better options if I find myself in the market for a premium phone running Google’s mobile OS. See Drew’s review of the latest Nexus flagship, for example. Lastly and as an afterthought (just in case BlackBerry is reading this), I’d have much preferred an Android phone more akin to the BlackBerry Q10 or Classic but slightly taller for maximum Android app compatibility. That’s something I’d buy in a heartbeat, and I expect so would many other BlackBerry fans past and present.